Language is a reflection of how people see each other. That is why responsible communicators are now choosing language that reflects the dignity of people with disabilities - words that put the person first, rather than the disability. Even the Associated Press Stylebook, the "journalist's bible," recognizes this responsibility and includes tips in its handbook on the appropriate way to refer to persons with varying types of disabilities. In general, do not describe or label an individual as having a disability unless it is clearly pertinent to the story or other communication. Use common sense. Avoid terms that are obviously negative or that connote pity, such as "handicapped," "crippled," "deaf and dumb," "lame" and "defective." If you aren't sure how to refer to a person's condition, just ask. Think people first and put the person before their disability. A person's disability should not define him; it is just part of who he is. Say "a child who has autism" rather than "the autistic child." Say "people with autism" rather than "the autistic." Don't use phrases such as "afflicted with," "victim of," or "suffers from" when referring to a person's disability. These references diminish the individual's dignity and magnify the disability. Wheelchairs enable people to escape confinement. People use wheelchairs for independent mobility. Do not use "confined to a wheelchair" or "wheelchair-bound." 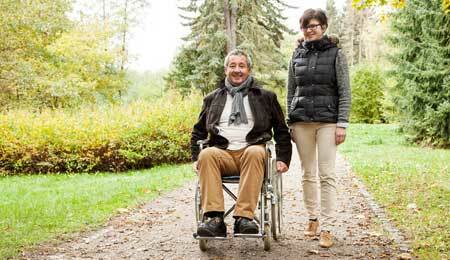 A person with mobility impairment "uses" a wheelchair. If necessary to the story, say why. Try to describe people without disabilities as just that, or use words like "typical" or "average" instead of "normal." Try to avoid casting a person with a disability as a super-human model of courage. People with disabilities are just people,not tragic figures or demigods. In following these few simple guidelines, you can write and communicate with confidence. Just remember: we are all "temporarily-abled." At some point in our lives, we will be faced with a disability of some kind and we must ask ourselves, "How would I want someone to write or talk about me?" "Handicap" is used to describe a barrier or a problem created by society or the environment, not a person's disability. Therefore, people should not be referred to as "handicapped." For example, "The teacher's negative attitude was a handicap to her." Or "The stairs leading to the stage were a handicap to him." Remnants of the term's old use may still be seen in contexts such as "handicapped parking" signs, but these are gradually being updated. "Impairment" is used to characterize a physical, mental or physiological loss, abnormality or injury that causes a limitation in one or more major life functions. For example, "The loss of her right arm was only a slight impairment to her ability to drive." Do not use "impaired" to describe the person. he is not "hearing impaired;" he is "deaf or hard of hearing." "Developmental Disability" is any severe mental or physical disorder that begins during a person's developmental years - before age 22 - and continues indefinitely. Individuals with intellectual disabilities, autism, cerebral palsy, epilepsy or other similar long-term disabilities may be considered to have developmental disabilities. The term "intellectual disability" is preferred over "mental retardation." "Deaf" refers to profound hearing loss. "Hard of hearing" may be used to describe any degree of hearing loss, from slight to moderate. "Blind" most frequently is used to describe a severe vision loss. Either "person who is blind" or "person with low vision" are acceptable. "Mental illness" is a term describing many forms of illnesses such as schizophrenia, depression and emotional disorders. Use "person with a mental disability" rather than referring to an individual as "deranged" or "deviant." Clinical terms such as "neurotic" and "psychotic" should be used only for clinical writing. Other terms such as "demented," "insane," "abnormal," "deranged" and "mad" often are used incorrectly and should be avoided. This article is provided courtesy of the Oklahoma Department of Human Services, issued 10/2006. Would You Like More Information On "People First" Language?